In what has been an outstanding fall season by Lady Demon athletes, three of our stars have chosen their future place of academic and athletic success! 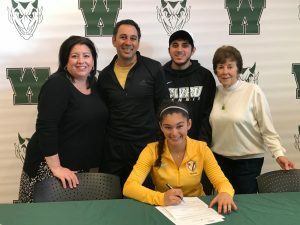 Demi, the daughter of Stacie and Head Girls/Boys Tennis Coach, Saumil Jhaveri and will become a Crusader for Valparaiso University. Demi was a member of 4 straight SWC Team Championships and also was 1st Team All SWC for 4 straight years. She is a 4 time district qualifier and 2 Time state qualifier. She and partner Ashley Michelich finished 4th in the state in doubles in 2017. Her career record is 107-26 overall and she was 42-1 in the SWC. Demi is undecided about a major at this time. 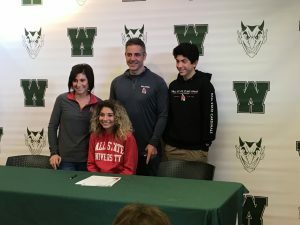 Emma, the daughter of Dina Nemo and Bill Peeler, will become a Cardinal for Ball State University. Emma is one of the most decorated girls’ tennis players in Demon history. She was a 4 time MVP of the SWC, 4 time 1st singles champion, 1st team All SWC 4 times and was never defeated by an SWC opponent going 43-0 over her career. She was a 4 time district qualifier, 4 time state qualifier culminating in a 4th place finish in the state this past season. For her career, she had a 119-23 overall record. Emma is undecided at this time on a major. 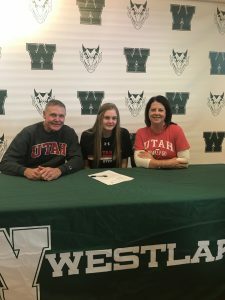 Leah, the daughter of Marla and George Schmidt, will become a Ute and play in the PAC 12 at the University of Utah. Leah will leave Westlake as one of the most decorated volleyball players ever. She earned 4 letters and was a three time 1st Team All SWC player. She was also a two time All District 1st Team Player in 2017 and 2018. She holds school records in: kills in a season (374) and kills in a match (30), and also holds the three top spots in both categories. She is second in school history in Aces in a season and Digs in a match. Her career stats were 1041 kills, 135 aces and 723 digs. Leah plans to major in film media video art and minor in sociology or law.